← You Ain’t Got A Thing, If You Ain’t Got That Swing ! In the Pukhan Valley, above the 38th parallel, in an area that up to this week had been untouched by war, 60 U.S. troops crouched into a Chinese-built trench line that circled a dome-shaped hill. They were holding a point far in front of all other United Nations troops in their sector. From their positions on the hill they could see the flat rice fields of the valley in front of them. Beyond the paddies was a bridge and past the bridge the shallow blue water of the river twisted away through a narrow gorge. But the farmhouse below them was deserted and burning and no one worked in the rice fields. A half-mile across the valley from the hill, the GIs could see a double trench line, punctuated with fortified pill boxes, along the side of a high ridge. From that hill the day before Chinese troops had fired heavy machine guns at the U.N. troops. As far as they knew the enemy was still there. Three of the GIs peered at the enemy trenches through field glasses and spoke code words into a walkie-talkie radio. They were Pvt. William J. Morin of Albany, N.Y.; Pfc. Wesley Falls of Rossford, Ohio and Pfc. Joseph D. Foley of West Medford, Mass. A few seconds later, puffs of smoke appeared on the enemy slope and the thud of mortar shells echoed across the valley. “White phosphorous,” explained one. Pvt. Morin spoke into his radio again and another blast hit the Communists, this time closer to their pillbox. In reply, the Chinese dumped a mortar shell a few hundred yards from the hill and the men in the trench ducked. Then, far below in the valley, another platoon broke from cover to the near bank and filed across the river and along a road leading to the enemy ridge. On the hill, Cpl. Richard Sellars, 21, of Kansas City, MO, sat in a trench and took apart his 3.5 recoilless rocket gun and started to clean it. The troops on the hill had no orders to fire. For the moment they were comparatively safe. But their buddies on the valley tableland walked forward warily, one file on each side of the road. 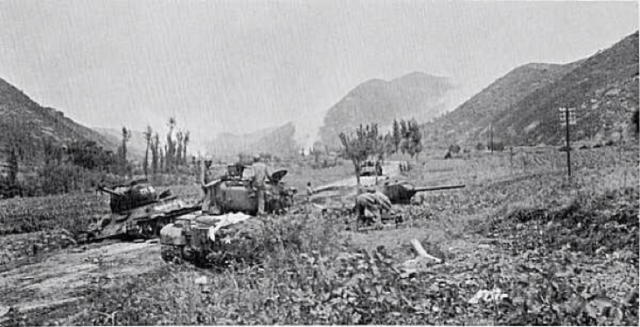 The tanks and machine guns they could see by merely turning heads were out of range of enemy rifles or machine guns – but to the Chinese on the ridge dead ahead of them, they must have looked like a double row of slowly moving targets in a shooting gallery. Near the bank of the river, they poked their 90-mm. guns at the Chinese positions. They were ugly, squat and menacing and seemed oddly out of place in the simple valley. To the units on the nearly surrounded hill, however, the tanks were old and trusted friends. The unit on the road had nearly reached the enemy mountain. Suddenly Pfc. Stanley Murdock, 23, of Menlo, Wash., on the dome-shaped hill shouted and pointed at the road. His buddies reached for their field glasses. At the same moment the clatter of enemy rifle and machine-gun fire came to their ears. On the road the attacking platoon was running back toward the river. Around them little spurts of dirt shot into them. One man seemed to fall into a ditch. The others fanned out into the paddies and flopped behind embankments. They fired at the enemy hill. Then the tanks opened up. Short bright flashes of orange spurted from their guns. At almost the same time, puffs of smoke appeared on the Chinese hill. A second later, two almost simultaneous explosions were heard on the hill. Along the trench the order came: “Stay down.” Incoming mortar shells whined overhead and exploded in the rice paddies to the rear. Pfc. Dean Paulson, 18, of Minneapolis, Minn., was complaining about food as he watched the unit lie flat. Pfc. Ronald Pocious, 26, of Los Angeles, started to reread some mail from home. Cpl. Byron Myers, 23, of San Diego sat hunched in the trench and put together the rifle he had been cleaning before the fire fight started. The cannonading ceased and an observation plane flew overhead. Pfc. Wayne A. Martin, 19, of South Minneapolis, identified it. The tanks pulled back and moved down stream half a mile. Jeeps ran freely on the river bed. On the dome-shaped hill, the platoon poked up their heads, started little fires and prepared to spend another night nearly isolated in the deadly quiet valley. — This is how a soldier died. 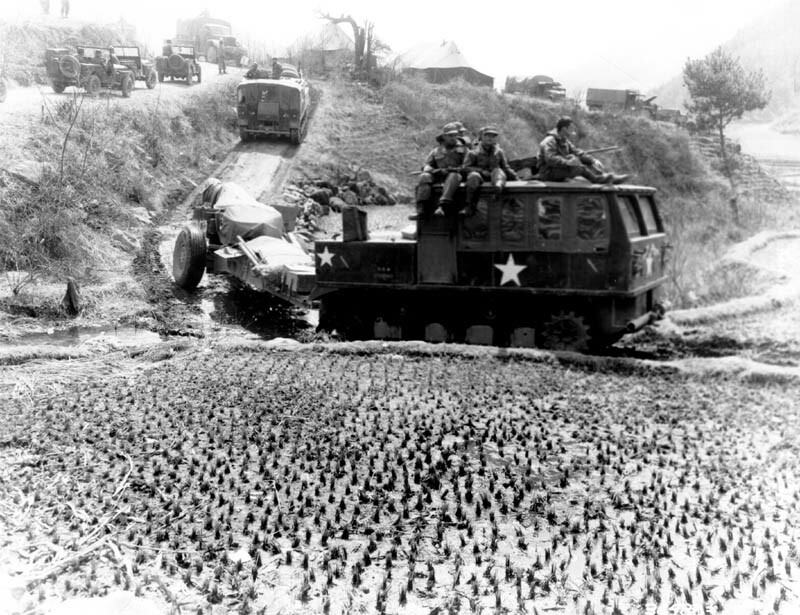 It was warm and dusty in the encampment between the river and the narrow Korean dirt road where the trucks and tanks rumble toward the front line and a few miles to the north. The soldier’s unit had just moved to the area. Nearby 50 of his buddies hammered on stakes for tent ropes. The shallow river rushed green and cool from the canyon to the north, but the road and the flat stoney basin was dry and stifling. Dust parched the soldier’s throat, dust stung his eyes. Someone in a rear command post had decided to hold his unit in reserve and the GI was grateful. He picked his way across the rocky river bank toward the water. Casually he looked around for mines. Just a day or two ago, the engineers had found some nearby. The river itself held a potential threat too. The Chinese held a dam far upstream and if they opened it the water would rise several feet. But the river looked friendly and green as it ran down the valley, the warm sun on the soldier’s back assured him that winter was over and the flat rocky river bank he walked across was like a thousand in America. Despite the dust and weariness this was a respite. He headed toward the river for a helmet full of water to wash the dust from his face and neck. A cupful would cool his dust-dried throat. He saw a truck moving up the river toward him and he stopped to let it pass. Once more he moved forward, crossing the path the truck had taken. Then, perhaps, he heard a click. Then came an explosion. A mine discovered in time. There was a mine he had not seen. A black puff of stone, dirt and smoke shot skyward. In it was a shapeless round object. The sound of the explosion bounced back and forth between the hills. Then there was silence and a ragged shape lay still and lonely on the rocky banks of the river. One hundred pairs of eyes watched solemnly as two medics lifted what was left of the thirsty soldier to a stretcher, they eased it to the litter and gently covered it with a GI blanket. Later the stretch of bank was empty and the trucks rolled by on the road. The water still gushed green and cool and the crash of artillery thundered down the valley from the front. Even though the U.S. has been involved in more than a dozen military conflicts over the past 70 years, Congress has not formally declared war on any country since 5 June 1942, when it signed off on military action against Nazi Germany’s allies Bulgaria, Hungary and Romania. 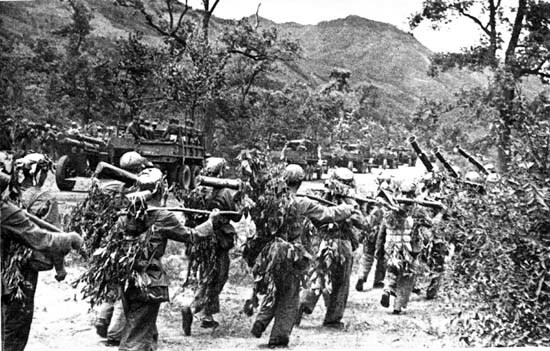 Posted on October 9, 2013, in Korean War, Uncategorized, WWII and tagged family history, History, Korea, Military, Military History, Pacific War, reporter, veterans, war correspondent. Bookmark the permalink. 62 Comments. As always, well written, good read. I like the history lessons I receive when I read your posts, yours is certainly one of my favorite blogs, thank you for your posts and thank you for checking into mine, I appreciate you sir. Thank you very much. But, no thanks needed for me to visit your site, I enjoy being there – keep it up. Paintball just doesn’t compare to a real war but this past summer I participated in my first paintball event which was to give me just a slight idea of how hectic combat actually is. I am incredulous that when the fight is on, people try to rely on what is supposed to be training for environments so hostile that it defies logic to think that one could possibly survive. These men; nevertheless, put themselves in the way of such harm repeatedly for the betterment of each other and people they swore to defend. It’s enough to boggle the mind – isn’t it?! Behind again… And its off to Japan again on Halloween… Geez, I’ll really be behind by the time I come back… But the first story was written with a distinct style…using names of the soldiers to bring it home… and the story of the last drink… How tragic. Yes, Mr. Steinberg has a great style of writing – the reason I requested his permission to reprint. Thanks for reading, Koji. I hope you have a terrific vacation in Japan (take plenty of photos) and we see you when you get back. I’m just finishing off the third in Shaara’s WWII trilogy. What great books. It amazes me he writes so well considering his father was also a standout (Killer Angels–loved that book). gpcox – Thank you for changing your mind and getting permission to post the entire articles. Very interesting and informative. Quite well written – I could picture the valley in my mind. Thank you for your dedication to research. Thank you. I was so surprised by Mr. Steinberg’s writing, so unlike the usual reporter’s voice, that I just had to ask for permission. An interesting and informative reading, so many questions to ask and answer. 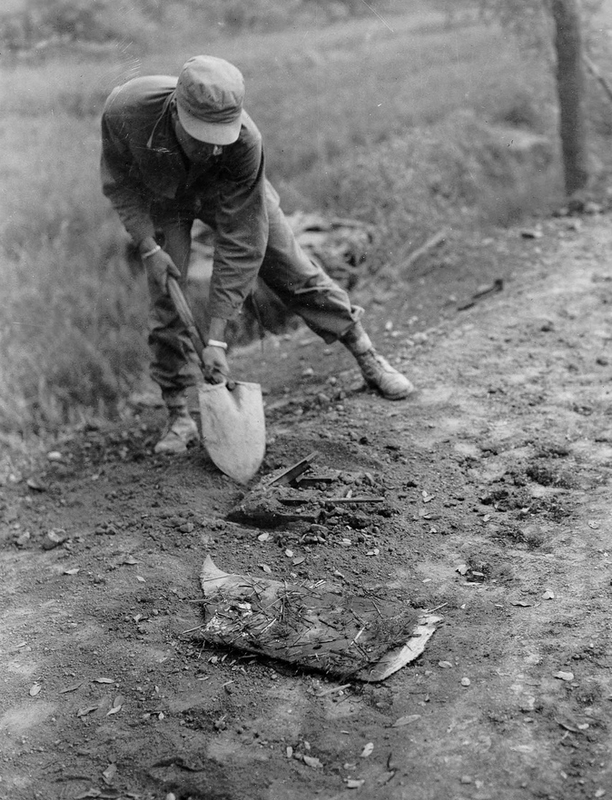 The personal aspects of the Korean war are exposed as they should be. I appreciate that post, and its expose of a war that was never officially declared over. I leave you with a link you might find interesting. Thanks again, to GP for posting my stories from so many years ago, and to all of you who have read them now and have said such kind things about them. I’m still writing and it is gratifying to know that thoughts and sights and emotions of a war, which still live starkly in my mind’s eye, can be communicated to others through the written word. You have a wonderful writing style, it’s from the heart and factual – what more could anyone ask for! It is I who must thank you for going out your way to get these articles to me. You can see by the responses that I am not alone and we still have your other pieces. Yes, you chose well to share this. I’m in tears, typing this out. Thank you, Susan. It is hard to describe what the men experience, but Mr. Steinberg did an excellent job. Couldn’t find your ABOUT .. so here goes …. Because you teach me, because you inspire me …. because .. all of the above!! Raw stuff indeed. Thanks for posting GP. Thank you, Tish. But, Mr. Steinberg deserves the credit. Reading those accounts made me think that war (bombing and shooting at each other) is really such a bizarre way to settle differences. And each time we engage in it, we seem to think it will work out better than the last time. It’s intriguing what nations do. Yes, it is. I find it incomprehensible; beyond what my feeble mind can wrap around and explain. I am also astonished that there have been 70 military engagements but no declaration of war since 1942. Maybe that is a good thing; I don’t know. And, why would it be a good thing? I don’t know that it is. But I was wondering if by making a declaration of war, the conflict is immediately heightened a hundred fold and becomes something far more fixed and rigid and non-negotiable. A declaration of war is so final and not something that you can back out of easily. Sorry, just idle wonderings, trying to puzzle things out. Andy Rooney also has a book of his wartime reporting experiences. I forget the title, but I’m sure a quick google will find it. I highly recommend it. I’d also recommend, for a “both sides of the issue” take, a book called “Soldat” by Guy Sajer. While it is about the German Army in WW2, it shows quite well how often the men in the field share the same hardships, be they of terrain, weather, supply, or poor leadership. “One click. One second. You’re alive, then you’re dead.” Don’t remember where I heard or read it, but that’s one of the most succinct, yet brutally descriptive, statements about being killed by mines. Thanks for both of those stories. My pleasure, John. Thanks for reading and adding in you information. That’s pretty much what I said to other commentators. The technology of the weapons change, but the result is the same. Thanks for stopping, Dan. So powerful…that touched my heart with sadness and sorrow. 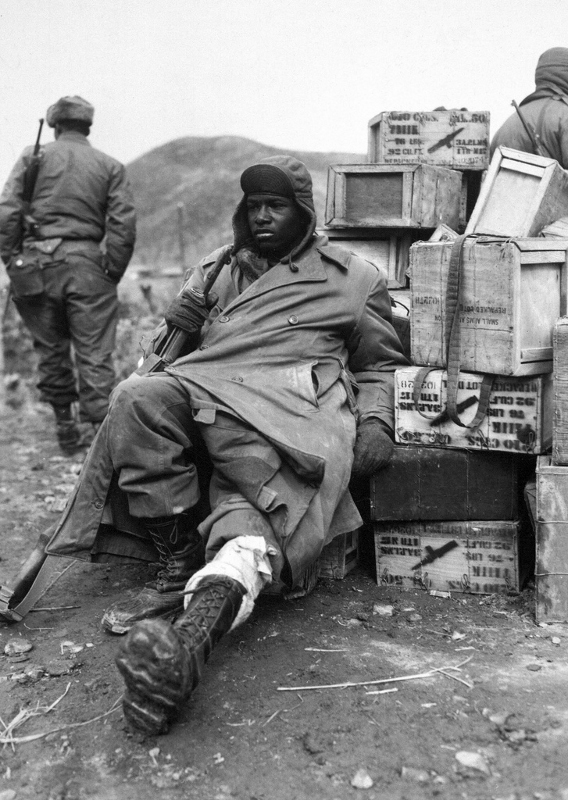 I think of NOW and the moment of TODAY, and the sadness of families of our fallen soldiers…and the shameful mess taking place up on THE HILL that has added more unneeded pain to their very lives at this time…God Bless You, Gp, for helping us to see history as it REALLY was. And, thank you for your service to our country. I would imagine it could have been written for any war. Thanks for reading, Linda. Jeez, it’s so good to see you back here regularly. As compelling and interesting as these articles are, I find myself stunned by the fact that the U.S. has been involved in more than a dozen military conflicts in the past 70 years, and yet Congress hasn’t formally declared war on any country. Don’t you think it had better come to a complete halt? Two moving, riveting pieces. Thank you for posting. My pleasure. Thanks for taking the time out of your day to stop in here. Thanks for another poignant look at the Korean conflict. Thanks for taking the time to read. I think Mr. Steinberg did an excellent job. The second story is heartbreaking. Yes, it is, but it basically describes war – as it is seen by every generation. The weapons may become more technical, but the result remains the same. Thanks for posting this and for all your posts. I also love your Note to ponder. Merci, Pierre. You honor me once again. Wonderful post. Rafael Steinberg is a great write and really conveys what took place…on an average day in the war, really showing the difference in attitude and purpose from WWII. That’s why I asked for permission to reprint in full. He certainly said it better than I would have. This was a horrific post. But I did enjoy it. Like in many wars, many of these soldiers were just kids or barely adults. Tragic. That was probably why the reporter included the ages. It brings the reality home. Glad you were able to reprint and share both of these. The one about the soldier going for a drink of water is very beautiful in it’s sadness! Thanks! Thank you very much. The author deserves the appreciation – I hope he’s listening. In Australia the correspondent most closely connected to the Korean War is Wilfred Burchett. Unfortunately, the story behind the connection is far from honourable. This article here will give you some measure of Burchett’s deplorable work, but the story is much broader than Korea – if you’ve got the stomach for infamy. There have been a couple of documentaries made about Burchett. He was also involved with the Vietcong during the 60s. Easy to imagine him scoring scoop interviews with the likes of Saddam and Bin Laden if he’d been alive during that time. With his reputation, I imagine so. I met Burchett several times in Panmunjom. He was covering the truce talks from the Communist side and I was covering from the UN side. Correspondents were allowed to talk to correspondents from the other side while we waited outside the talks. Actually Burchett and his colleague Alan Winnington, from London’s Communist Daily Worker, were often helpful to us because, unfortunately, our own side did not always tell us what was going on. Burchett and Winnington apparently got accurate briefings from the delegates on their side and sometimes relayed the information to us. It turned out to be accurate almost all of the time. Burchett also interviewed General Dean, who was a POW in North Korea at the time, and gave us at Panmunjom a full and accurate account of how Dean had been captured. That was quite interesting…reminded me of the whole spy era industry that was quite active during the cold war. I am glad that someone had the courage to speak the truth, knowing that most would dismiss the words without question. It is my opinion that truth, though it may be distasteful, is better than lies. Thank you, Mrs. P. Some people apologize when they have some awful story they feel will offend me, but I keep repeating, history is history and it ALL must be recorded. There is no doubt that Burchett was a thoroughly despicable man, a man who hated his country and who should have been imprisoned for his treason. So why did our media refused to relate these facts to the public. Because Burchett is still a hero to many, if not most, Australian ‘journalists’, not in spite of his treason but, I believe, because of it. Regardless of their best efforts, our left-wing ‘journalists’ will not be allowed to flush Burchett’s treason down their Orwellian memory hole. I read a few of correspondent Ernie Pyle’s(WW2) children’s books when I was around 12. Thought they were pretty good. Carl, I never even knew he wrote children’s books. Thanks for putting that in!